Flowers and plants, in their unbelievable array and beauty are a benefit for the soul. Through superior floristic artistry, as well as unique composition and presentation, it is possible to inspire emotions and to create a green living space and a more pleasant work environment. Flowers and plants calm the soul, stressed by the hectic pace of modern life, and grant a welcome respite from the rigours of everyday living. My love of nature and the joy of flower arrangement have inspired me to put plants at the centre of my work and to afford them the appreciation they deserve. With this passion, classical workmanship joins contemporary design to create exceptional and often surprising results! 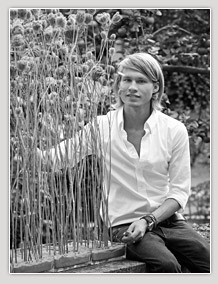 My floristic work is grounded in the superb professional training of Gregor Lersch, the nationally and internationally renowned master florist, an experience for which I am eternally grateful. My international experience includes Creative Art Director at "Flowers Talk" in London as well as an appointment as Ship`s Florist during a world cruise aboard the luxury liner "MS Deutschland". I feel privileged to have benefited from the influence of a number of cultures which have influenced my work. In recent years I competed in a wide range of competitions. I will always be grateful to my employer, Floristik Jentsch in Bargteheide, for his support and encouragement during this period. As the winner of the "Silver Rose" competition in Schleswig- Holstein, I qualified for the German championship in Berlin where I won the title of Vice Champion. I was named "Newcomer of the Year 2008"at the IPM and shortly thereafter I participated in the Junior European Championship in Brussels, where I represented Germany winning the title of Vice Champion. Upon graduation from the Floristic Master School in Straubing, I received the Bavarian National Award for outstanding achievement as Best Student of the Year. Subsequently, I worked as floristic project manager for the international flower wholesaler H.B.I. Fleura Metz , where I held seminars and demonstrations in Germany as well as internationally. During this time I was able to not only demonstrate my artistic and organisational abilities, but H.B.I. Fleura Metz also gave me the creative and economic freedom to participate in other important competitions. In 2010, with this support I once more faced the challenge of an international competition at highest level, The "Alpe Adria Cup" in Austria, which only takes place every ten years. Here, I placed first and won the Championship.